Believe it or not, I LOVE Disney Transportation! For our family Disney Cruise and Walt Disney World vacation this November, we're staying off property for the first time since I was a wee child, and we'll have a rental car. One of the things I'll miss most is the ease of Disney Transportation. 1. Disney's Monorail: This favorite should come as no surprise since it's made an appearance in my previous countdowns as a way to tour the Deluxe Resorts as well as a great way to get some neat photo opportunities. 2. 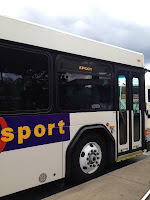 Disney's Magical Express: The free transportation from the airport to your Disney Resort (and back again) is how Disney fans know they're finally near the magic! The best part about the DME is that they get your checked bags for you and deliver them to your room. All you have to do is sit back, watch the fun show on the TVs on the bus, and let the excitement build as you get closer and closer to Disney World. 3. Boats: Another of my favorite ways to travel at Disney is by boat. In fact, I'll take a boat or the Monorail over a bus any time that it's possible. Some boats go from Resorts, like the Port Orleans Resorts, to Downtown Disney. There's a boat that enters EPCOT at the International Gateway in the World Showcase. Some boats go from Magic Kingdom to other Resorts, and there's even a boat from the Disney TTC to Magic Kingdom! I'll get to take that one on our next trip. Other boats move you around within the parks like the one in EPCOT that crosses the Lagoon. Boats are a peaceful and cool way to travel the World. 4. 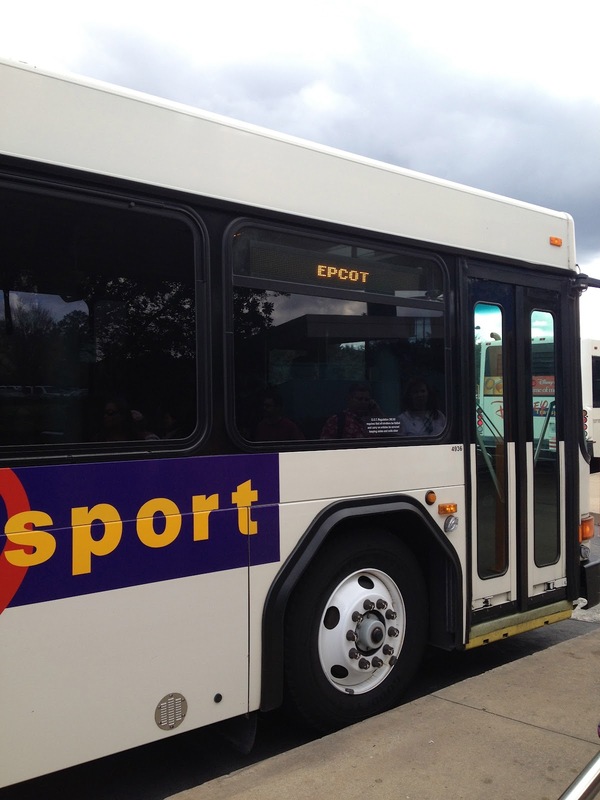 Busses: Yes, Disney busses are honestly a GREAT way to travel around Disney World. Some people slam them, but on each trip, I usually only have one bad experience with busses taking forever to come. In the evenings after nighttime shows, you will have to wait in a long line, but it beats trying to drive yourself in unfamiliar traffic. The busses are air-conditioned and come fairly regularly. One quick note: when a bus has standing room only, ask yourself "do I want to stand here and wait for the next bus knowing I'll be going nowhere for the next 20 minutes or so, or do I want to keep standing but be on a mode of transportation that gets me closer to my destination (typically your warm bed)?" I always choose stand on the bus over stand there going no where. @P19letUK was first to answer with encouragement from @gailyw. 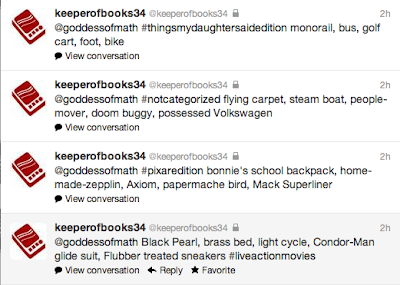 My brother-in-law, @keeperofbooks34, is always one of my favorite contributors! This is a Motor Launch just in case you're wondering. agreed that pixie dust was a good 5th mode of transportation. loved the top 2 lists! Ready for the giveaway yet? Well of course you are! 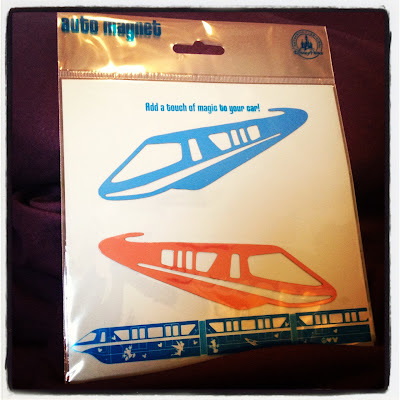 It's small, but I adore these auto magnets that I found at the Disney Store Outlet this summer. It doesn't hurt that they feature my favorite mode of Disney Transportation! They can be yours if you follow the Rafflecopter directions below! Wouldn't these look neat on your vehicle? Good luck to all my lovely readers! 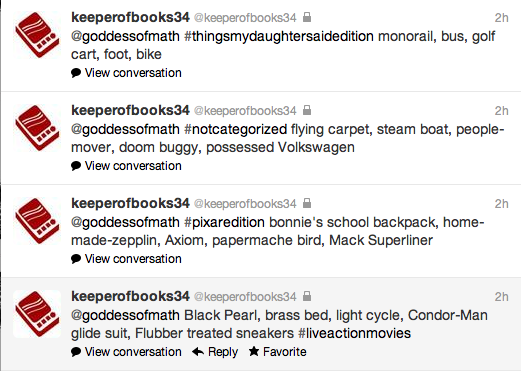 You can tweet daily to win, so keep coming back. Giveaway ends 9/26/2012. I am working on a project right now that these would be perfect for!! What a fun prize! My favorite mode of Disney transportation is probably the ferry to the MK. What fun giveaway! The monorail is my absolute favorite! Very cool giveaway! I'm a monorail fan! Great giveaway, Joanna! I'm a monorail fan myself! I'm with you, though - I love all forms of Disney transportation! I love riding the boats, especially if you catch one during wishes. my asd kiddo is obsessed with riding the trains at disney! then again ALL of the rides have some sort of train for the most part, BUT when he gets dragging, we hit the monorail loop & lunch at the train station so he can watch as the monorails come thru (the contemporary!) it's his happy thought which makes it OUR happy thought!!! The monorail is my favorite, we usually ride it around and around WDW, But I love riding the boats too, and take time to relax, Great Giveaway.. Hands down the Monorail has always been my favorite form of Disney transportation (although the boats from the WIlderness Lodge to the MK are a close second. I would have to say that I love taking the Ferry to Magic Kingdom. Such a hard choice! Those Friendship Boats hold a special place, but no Disney trip is complete until we've had one ride on the monorail... I'm a new follower!! What's your favorite mode of Disney Transportation?